The morning of Tuesday November 13th, 1956 began like most others in west Ottawa. The weather was typical for mid-November, with sub-zero temperatures overnight leading to chilly mornings for commuters travelling into the city for work or school. On this particular morning the temperature hovered around zero, and the skies were largely cloudy. A dull November morning in Ottawa, but it would not stay that way for long. The OTC was of course still running streetcars in 1956, but the writing was on the wall for their future. The trams were losing the city money. Big money. 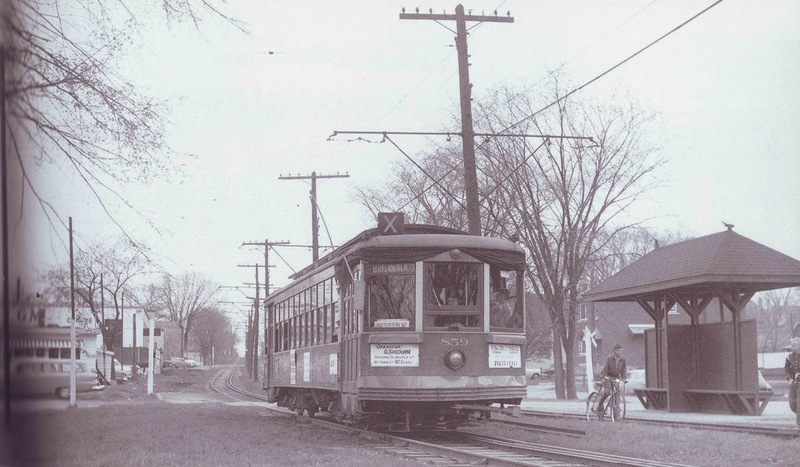 The City had acquired the streetcar line from the privately-operated Ottawa Electric Railway in 1950 for the incredible price of $6.3 million. It did not take long for the evidence to flood in that it was a bad deal. The infrastructure and the cars themselves were aging, but besides that, North America was in the midst of a serious transition to roadways and highways. Car was king, and buses for public transportation were seem as cheaper, easier to manage, and more modern. The railway was on its way out, and by 1956, the lines were expensive to run. It would be a little over a year later that the City would announce that they would be scrapping the entire streetcar service, and indeed they did, with the final car running on the Britannia line in May of 1959. Back to November of 1956, the streetcars from Britannia would pick up commuters in the morning, and bring them into Ottawa along Byron Avenue to Holland, then north to Wellington, then east over the Somerset Bridge to Preston Street, north to Albert, and then east into downtown. The entire trip would take between 35 to 40 minutes. Highland Lawn Bowling Club (on right), looking east. The would be the last little waiting station before Churchill. That morning, streetcars were coming through Westboro heading east every five minutes or so. One in particular was driven by conductor Yvon D'Aoust that morning, which passed through McKellar Park and Westboro just before 8:30. By this point, the train was packed full, standing room only, with an estimated 70-75 passengers on board, largely students and office workers. 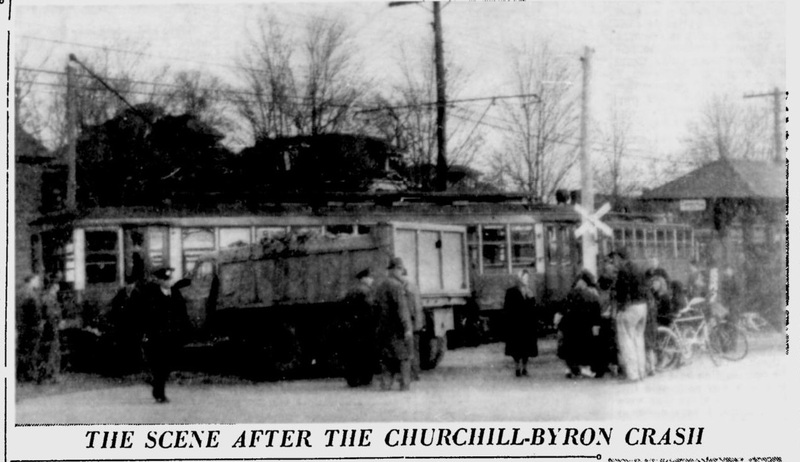 The streetcar went up the hill on Byron to Churchill, and stopped at what was then a stop sign at the Churchill intersection. Operator D'Aoust then crossed Churchill and stopped at the small station where 7 passengers were waiting to board. At the same moment that morning, Gaston Regimbal of Forward Avenue, a 24-year-old truck driver with the Frazer Duntile Company was driving his full dumptruck northbound on Churchill Avenue. The truck was full of rock recently mined from Frazer Duntile quarry at Clyde Avenue. The Citizen reported it was a 20-ton truck filled with 17 tons of stone; the Journal said it was a 10-ton truck full. Either way, it was a big, heavy load coming north up Churchill. Regimbal was driving at what he later estimated was about 10 miles per hour, and was approaching the Churchill hill, when he noticed the Churchill Public School traffic patrol flagging him down to stop. "I eased on the brakes and nothing happened" Regimbal said later, "I thought for a second I could swing east into Byron avenue but there were some kids standing on the corner." He considered wheeling around the children, but at that very moment, a car rolled up to the westbound Byron Avenue stop sign at Churchill. When Regimbal realized he wasn't going to be able to stop the truck, he spun his wheel to the left in an effort to simply swing the truck around the streetcar, in the hopes of avoiding an oncoming car as well. However, he miscalculated by 10 feet. The Journal reported: "When the truck hit the tram, an avalanche of rock cascaded over its cab roof. The heavy stones crashed in through the cab windows among the passengers. Oddly, none of the big rocks hit the crowded tram occupants." 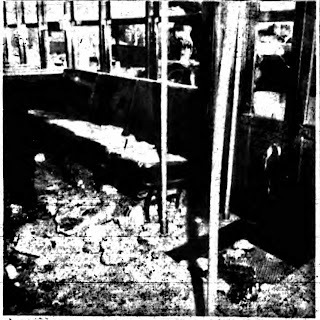 The Citizen added "Crushed stone burst into the street car through shattered windows, showering passengers with broken glass and debris." Regimbal told reporters later "There was a terrible crashing sound and people began to scream. I cut the power at once, and threw over the lever which controls the doors. The front doors opened immediately, but the back doors were jammed." He added that after the initial shock there was little or no panic among the passengers, and all of them filed out quickly through the front doors. "Some were bleeding about the face and head, and a few had to be helped, but it seemed apparent, almost at once, that no one had been killed or badly injured." Regimbal himself was shaken up and had cuts to his head and face. Miraculously, no one was killed, or even seriously injured. There were a total of 10 injuries, but none of them major, beyond cuts and bruises. One can only imagine what would have happened had the streetcar luckily not been positioned there to hit, and the truck instead would have barreled down the hill on Churchill towards the much busier Richmond Road intersection out of control and gaining speed, during the peak of the morning rush hour. The results could have (and likely would have been) devastating. "It was a lucky thing at that, for God knows what might have happened if I had torn down the Churchill hill out of control." Regimbal told the papers. Someone asked him why he hadn't tried his hand brake. "Ever try to stop 10 tons with your arm?" he asked back. "We were over the crossing and almost stopped - in fact barely moving - for the passenger pick-up, when wham-bam, it sounded and felt like a bomb had hit us. The back of the car was jarred and jolted up and over almost to the west-bound track. Then there were shouts and screams and the tinkle of falling glass. We were lucky; everybody could get out under their own power", said D'Aoust. Looking west down Byron. That's the laundromat at right. The view looking east, showing the point of impact. The injured were all taken to the Civic Hospital via Exclusive Ambulance, Ottawa Police and OTC cars. The Civic had been called from the scene, alerting them to the possibility of a major emergency. Every available doctor and nurse was waiting when the injured began to arrive. A nurse reported "We did not know how bad the accident was, and we were ready for anything. When they began to come in there was a lot of blood in evidence, but we realized quickly that we had nothing more serious than some nasty cuts and ugly-looking bruises to care of of. A few were suffering from shock, but no one was in serous condition." 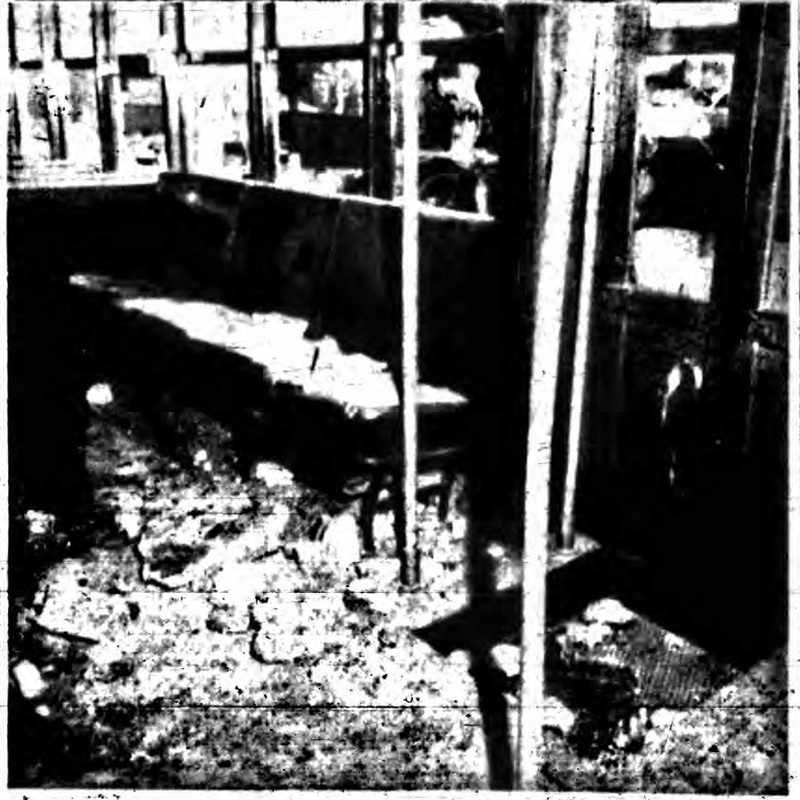 Injured were Regimbal (the truck driver), D'Aoust (the tram operator), and passengers Donald Stevens (40 years old), Mabel McGovern (31), Bruce Keeler (15), Lloyd Gore (14), Paulette Lacosse (10), John Gleeson (12), Dalton Parks (16) and William Croshaw (14). Photos of some of the passengers, taken just after the accident. 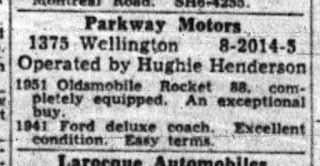 From the Ottawa Citizen, November 13 1956 evening edition. "I was sitting in the seat nearest the window when the truck hit", said Donald Stevens. "It's a miracle that I escaped with only these cuts. The rock slammed in among us. There was a great swirl of dust and a lot of screaming and then we started sorting ourselves out." Mr Stevens was swabbing several bloody cuts on the side of his face and the back of his neck with his handkerchief while telling the papers his story. "Sure I saw the truck veering in on us, but in the space of a couple of seconds what can you do, except sit there frozen and helpless, staring?" 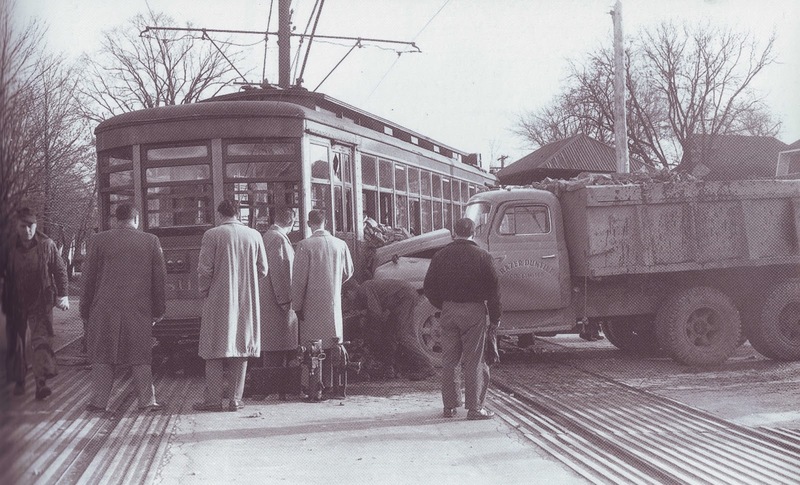 Mabel McGovern was located at the front of the streetcar, standing, when it was hit "I didn't see a thing" she said "First thing I know I was looking at the car floor. The impact flung me on my face in the aisle. The thing I can't understand is that it was my ankles that were hurt." Bruce Keeler was sitting in one of the rear seats facing south on Churchill and saw the truck approaching "I ducked my face in my hands and waited" he said, "It was a terrific jolt." Harold Watson, 23, was sitting on a side seat at the rear reading a newspaper. "Suddenly I was hurled forward out of the seat and people standing in the aisle were bowled over like ninepins. Broken glass flew around my head and one jagged piece ripped right through my newspaper. But I wasn't even scratched by the glass. All I got was a bruise above the left knee. That must have been when I was thrown to the floor." glass covering the floor. From the Ottawa Journal. Paulette Lacasse, 10 years old, had been standing in the aisle "I was never so scared. I was so frightened after it happened. I couldn't move. I didn't know for a minute what had happened, but I was sure it was awful." Dalton Parks was one of two boys from Stittsville on the streetcar, and reported a "tremendous crash" when the truck hit. "The street car seemed to lift up in the air for a minute. I thought it was going to turn over but it didn't." Area police were also busy that morning with another train-truck accident. Ironically, just twenty minutes after the Byron-Churchill collision, a separate accident took place in Hull, which saw a 55-year-old Gatineau Point man killed. An Ottawa to Montreal CPR passenger train struck a panel truck at a level crossing on St. Henri Street at 8:50 a.m. The Westboro crash stopped all streetcar traffic on the Britannia line for over two hours, with twelve cars on each side lining up in the queue behind the accident. 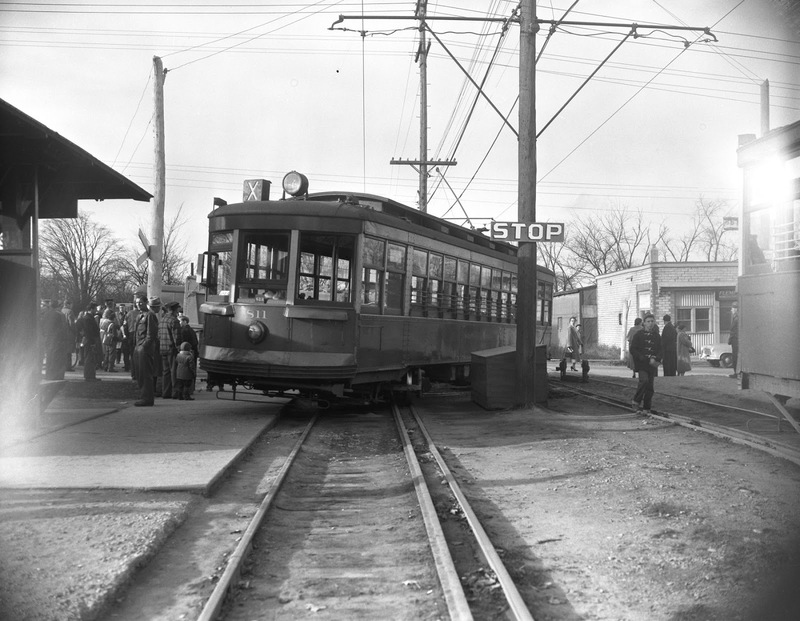 The streetcar's rear wheels, as shown in the photos above, were pushed all the way over to the west-bound line, buried into the right of way, and blocking both tracks. The OTC acted quickly to reroute buses to pick up the streetcar passengers, sending buses from Churchill to Britannia, and east from Churchill to Holland Junction. They also rushed work crews to the scene to put the train back on the rails and clear the tracks. Interestingly, Churchill Avenue just prior to the accident had been targeted as a concern by local residents, who complained that it was being used by heavy commercial traffic as a cut-through between Richmond Road and Carling Avenue. Local truck traffic was permitted at the time, but not through-trucking. Many residents had been actively complaining to the City Police, but nothing had been done about it. Just a week prior to the crash, Controller Donaldson had asked City Police to investigate the traffic on Churchill. It was simply an accident waiting to happen. Thankfully, no lives were lost and a major Westboro tragedy was averted. Ottawa Citizen evening edition, November 13, 1956. Nepean High School Class of '67! And don't forget I will be set up tomorrow (Saturday) from 11-4 at Wellington and Gilchrist for the Tastes of Wellington West festival. I'll have a ton of stuff, including rare videos of trains travelling through our neighbourhood in the 1960s, and fire insurance plans of Wellington Village and the surrounding area from 1922! Come find your street/house in 1922. Cheers for now! The Kitchissippi Museum returns to Tastes of Wellington West! 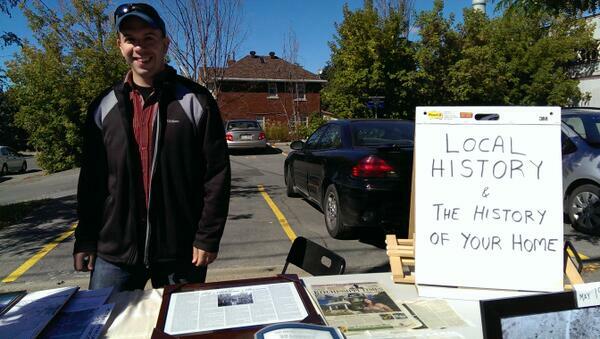 As I do every year, I will be setting up shop for Tastes of Wellington West. This year Tastes falls on Saturday September 16th, from 11 a.m. to 4 p.m. I will be set up at the corner of Gilchrist Avenue and Wellington West, with a few tables of photos, maps, artifacts and more. Stop by to have a look through, share stories, or feel free to bring along photos if you have some neat shots from our area's past that you'd allow me to scan/borrow! Of course, my booth will be weather dependent, so here is hoping for no rain! Hope to see you there. Cheers! Here I am at Tastes of WW in 2013! 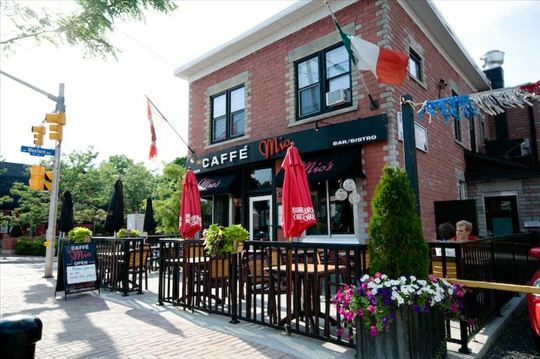 Caffé Mio over its 12 years of existence at the corner of Wellington West and Western Avenue has become one of Wellington Village's most popular spots. It isn't easy to survive that long on a main street; many other Wellington West restaurants/bistros/pubs have opened and closed unable to find the recipe of success. 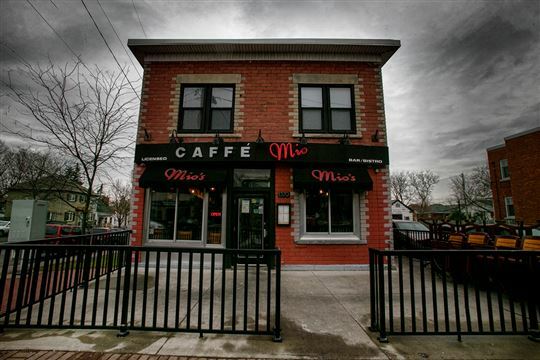 Mio has, and the little bistro-bar in the converted corner store continues to grow, both amongst its large established clientele, and also to new visitors to the neighbourhood. It has a constantly changing menu, and a reliably comfortable atmosphere; a perfect combination. The focus of my article today is not so much on the business itself, but on its historic building. Dating back nearly 100 years, the building has stood the test of time on developing Wellington West. It has a unique appearance, with its instantly recognizable extra-large bricks and eye-catching slightly-pink and white colour scheme. The building has also been seemingly extremely well maintained. Adding to its importance is that it truly was at the western edge of the City of Ottawa until 1950 (Western Avenue was the border between Ottawa and Nepean until the great annexation of 1950). 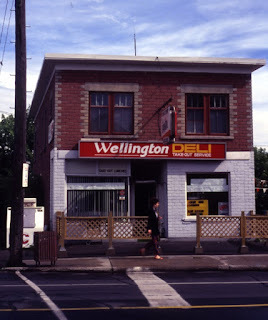 It had the highest address number on Wellington Street (though that later changed in 2002 when the western end of Wellington was extended to Island Park Drive). I love Caffé Mio, and I love the building even more (of course, I'm a history/built heritage geek, so that probably comes as no surprise). I appreciate so much how the building has been preserved, it truly is a Wellington Village landmark (one of many that stand tall on Wellington West). It's a great property in a great neighbourhood (I'm just a block over on Gilchrist myself), and I have a life-long tie-in to the place. I spent some of my favourite times as a kid there, as it was the nearest candy/convenience store to our house, so most of my allowance money ended up there throughout 1986 and 1987. The property was originally on the western edge of the Stewart family farm, which existed from 1832 until 1893. Western was the border between the Stewarts and the Cowleys, and a little lane (and likely a fence or two) separated the two farms in the 19th century. Western was appropriately known as River Street in its earliest days, as it was the path you would have used to access the Ottawa River from Wellington. Beyond 1893, for the next 27 years the property sat largely empty, part of the holdings of a land investment company waiting for the real estate boom that the Roaring Twenties eventually provided. I've previously detailed that fateful auction day in June of 1920 when the Wellington Village properties were all sold under a circus tent at Holland and Wellington one at a time (http://kitchissippi.com/2015/04/17/history-of-wellington-village-ottawa), and the Mio lot was of course a part of that auction. The buyers at said auction were a mixed group. Many were simply investors, looking to scoop up a few cheap lots in anticipation of selling them for a quick profit. Others were small-time developers, anxious to make their mark in the newest Ottawa subdivision. The third category were the dreamers, the individuals who were sold by the Ottawa Land Association's promises of a cheap lot, and assistance to build a home right away, for less than the price of renting a home. The Mio lot was one of four lots purchased that day by Albert E. Knight, a 38-year old policeman with the Ottawa Police Department. Knight had come to Canada from England, where he had been a policeman with the Worcestershire force. He joined the Ottawa Police in 1912 as chief police photographer, and from 1914 until his retirement in 1946, he was in charge of the issuing of licenses (largely for dogs and cars), retiring with the rank of Inspector. Knight bought his four lots for $1,020. Two of the lots were the Mio lot and the one next door to the east (the used car lot), and the other two were two lots at the south end of Ross. It is probable that Knight acquired them solely as an investment. Indeed he never took out any permits, nor built in Wellington Village. In May of 1922, Knight sold the Mio lot to Antonio Mendola for $600. He would certainly profit on that lot, as anyone who re-sold them prior to the late 1920s did. The adjoining lot (car lot) he wasn't as lucky with, holding on to it for 13 years until losing it due to unpaid taxes during the depression (land values reached extremely low levels, new home construction was at a standstill, and the City was still charging relatively high property taxes, leading many to simply surrender their lots rather than pour money into them year after year in the hopes that the depression, and later WWII, would end). 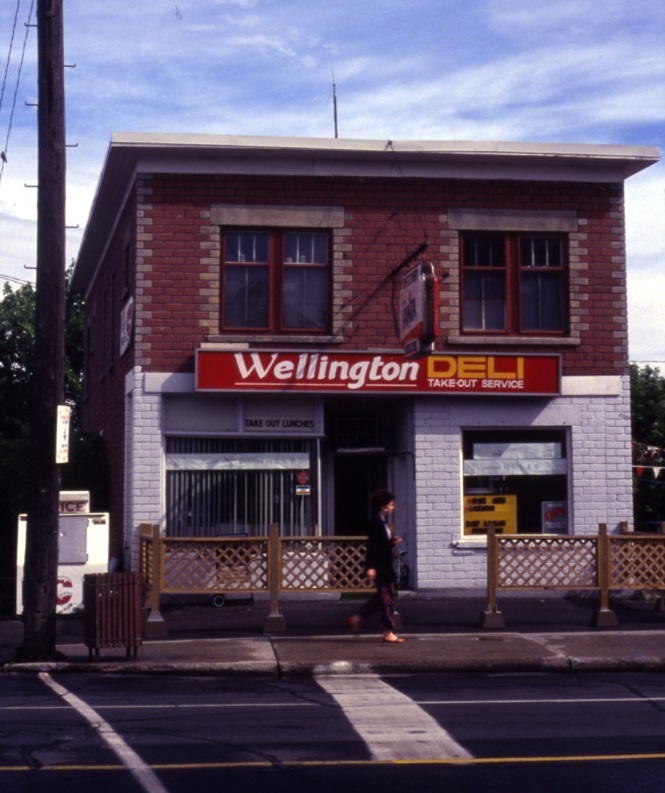 Antonio Mendola operated his own grocery store at 438 Preston Street at the corner of Pamilla (now EVOO Greek Kitchen restaurant), and must have had a plan to build a new grocery and confectionery shop on Wellington Street in the new subdivision, and move. ad for Mendola's original grocery store on Preston. From the Ottawa Journal, March 1st, 1920. Mendola did build it, likely starting in 1924, and completing it sometime between the fall of 1924 and the summer of 1925. But it was not Mendola who would open for business in the new building. For reasons that are unclear (but are likely financial or personal related), Mendola put the property up for sale just after construction was complete. He sold in January of 1926 for $1 and the assumption of the remaining balance of the mortgage, a transaction which seems to indicate Mendola was simply looking to be rid of the property. He was soon after listed as living back on Preston Street, running a store next to where he previously had, at 440 Preston Street. Rather than Mendola opening in the new Wellington Street storefront, it was 31-year-old Edward S. Howard who opened the first shop in the future Caffé Mio building in very late 1924 or early 1925. Born in County Kerry Ireland, he arrived in the Ottawa as a teenager. He married his wife Edna Smith on the lawn of her family cottage in Champlain Park in 1913. 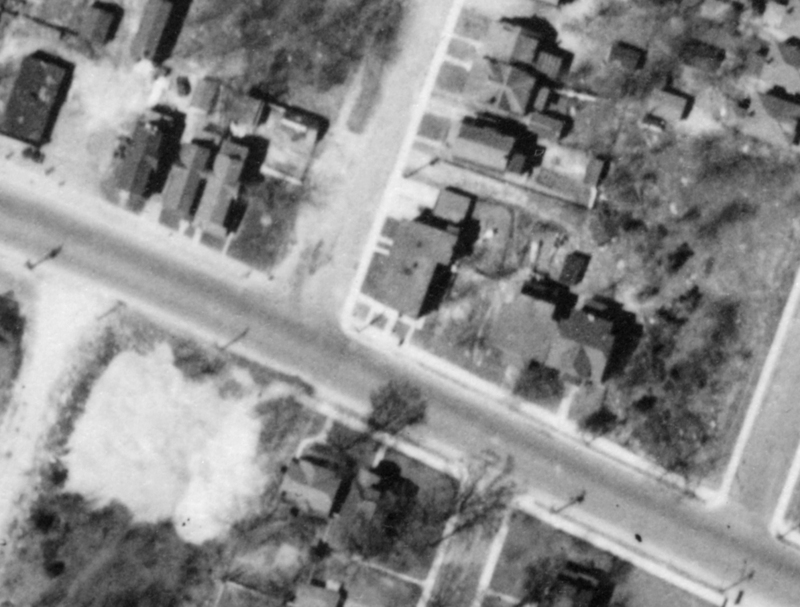 (That cottage/house was 101 Cowley Avenue, located on the northeast corner of Pontiac, now NCC-owned greenspace. Edward and Edna lived there until it was expropriated by the NCC in 1959). The Howards operated the grocery/confectionery store until 1929 when the building was sold. Howard then moved on, still working in the grocery business, but with Bryson-Grahams. Meanwhile, Mendola sold the store in 1926 to John Wesley Summers and his wife Edith, of Westboro. John was 34 years old, and employed as a civil servant, with the intriguing job of photostat operator with the Department of the Interior (a photostat being the earliest version of a photocopier, which as you can imagine in the 1920s sounds like it was quite the involved machine). The Summers seemingly acquired the property as an investment, holding it as landlords for just three years, before selling in February of 1929. It was in 1929 that the property begins its first true notable era when Joseph Shaeen purchased the property, for the total cost of $3,950. Joseph had led a very interesting life to that point. He was born in Syria in 1890, and had escaped from there in 1909. He came to Canada and settled in the tiny oceanside town of Pouch Cove, Newfoundland, where he operated a butcher shop. He fought in WWI as a member of the Royal Newfoundland Regiment, enlisting in December of 1914. In July of 1916, while in battle in Beaumont-Hamel, France, Shaeen was shot in the left leg. He spent two weeks in a field hospital, transferred to England, and from there spent an incredible 29 months in hospitals, eventually returning home to Newfoundland in December of 1918. By that time, his medical file indicates he had received 18 operations on his leg, which was still not healed. 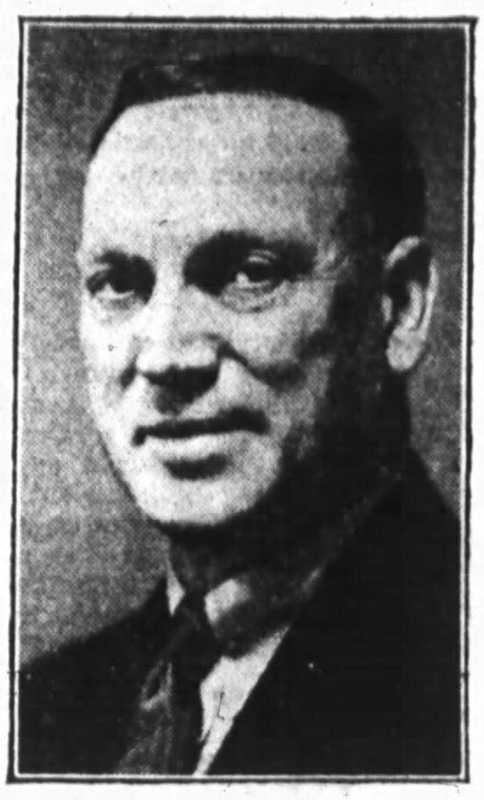 He later spent 5 months in Camp Hill Hospital in Halifax in 1920, at which time records seem to indicate the leg was amputated. He also lost his first wife during this period as well, and he had two young children when he enlisted, for whom there is no trace beyond that point. In 1925, he married his second wife Alice Ganim, who was also Syrian-born. Travel records show he left Newfoundland (which required immigration, as Newfoundland was still not part of Canada at the time) for three weeks in 1925 to come to Ottawa, and it was here that he married Alice. The couple returned to Newfoundland. There they had their only child, a son Albert. In October of 1928, the family planned to move to Ottawa, and boarded the S.S. Caribou from Port-aux-Basques to North Sydney, Nova Scotia. 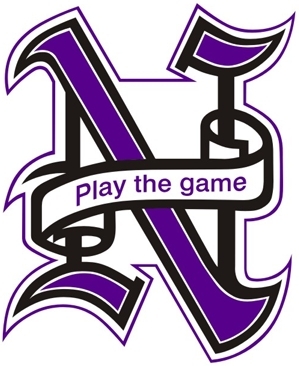 However, upon arrival in North Sydney, the family was rejected. They appeaed the decision, and for 16 days the family would have stayed in limbo (perhaps at some kind of temporary holding location), until the appeal was heard. It was approved, and they were free to come to Ottawa to start their new life. It did not take long for the Shaeens to find their new home: the Caffé Mio building on Wellington West! On February 6th, 1929 the sale was official. The Shaeens paid $3,950, half down and half paid through a mortgage from Westboro's Rev. Steacy of All Saints Church. It was more common than not in those days for loans to be acquired from individual lenders, rather than a bank or loan company. How the Shaeens met Rev. Steacy and were able to borrow $2,000 from him after being in Ottawa only a few months must be an interesting story unto itself. Early records list Shaeen's business alternatively as a restaurant, fruit store and confectionery in different sources. It is likely true that the shop had a few functions during the early years, as the Shaeens would have done anything they could to stay afloat during the difficult years of the depression. The building was originally smaller than it is now. An addition was put on the rear between 1930 and 1931 by the Shaeens. 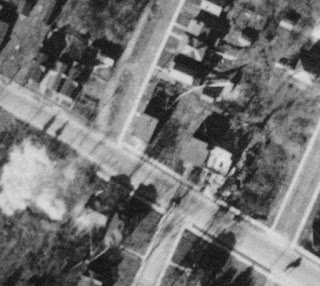 This can be seen in the aerial photo comparison between 1928 and 1933 below. That is Wellington running left to right, with Western and Gilchrist running north off of it. The building on the northeast corner of Western is noticeably extended in the 1933 photo. Initially, the Shaeens lived in a split-level apartment, occupying all of the space above the store, and a portion at the back of the ground floor. The renovation in 1930-31 added an additional apartment on the 2nd floor, and another unit on the ground floor, both with Western Avenue addresses. In August of 1935, Shaeen acquired the vacant lot next door from the City of Ottawa, who had acquired it due to unpaid taxes by its original owner Albert E. Knight. It was a shrewd acquisition by Shaeen, who picked it up for next to nothing (less than $100 I believe) to give himself an extra-large parcel of land fronting Wellington Street. This double-lot remains as one parcel today. Joseph Shaeen continued to operate his store until 1947. I found very little written about the family or the store during this period, and in fact could only find one advertisement for the store during this entire time, an ad which ran on Christmas Eve 1936, which misspelled Shaeen's name. Attempts to locate a descendant of the Shaeens proved difficult, and thus I am unable to find any vintage photos or stories from this period, unfortunately. Joseph retired in 1947, and sold the building and the lot next door to Esau and Rose Kavanat, who had been living in Spencerville. The store then operated as "Kavanat Confectionery" for 2 years, then "Western Confectionery" until 1961. 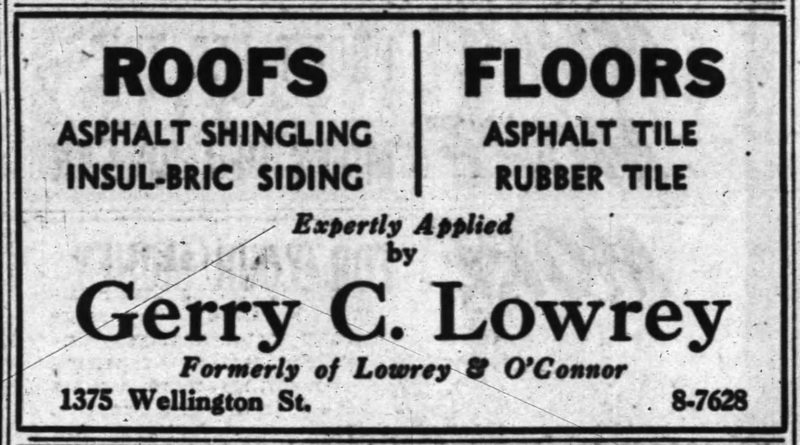 In the summer of 1948, neighbourhood institution Gerry C. Lowrey Roofing opened in the vacant lot at 1375 Wellington Street. They must have opened an office in a temporary structure of some kind, perhaps using the lot for storage of roofing materials. There certainly was no permanent structure on it at the time, and in an aerial photo from 1953, there was not a temporary one by then either. 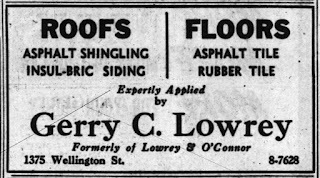 Soon after the lot was co-leased by A. Bethell & Son, a "concrete floor" business, who shared the space for a year or so with Lowreys. Lowreys remained until April of 1953, when they moved a block over into the building at the corner of Gilchrist which is now Lauzon's Music. 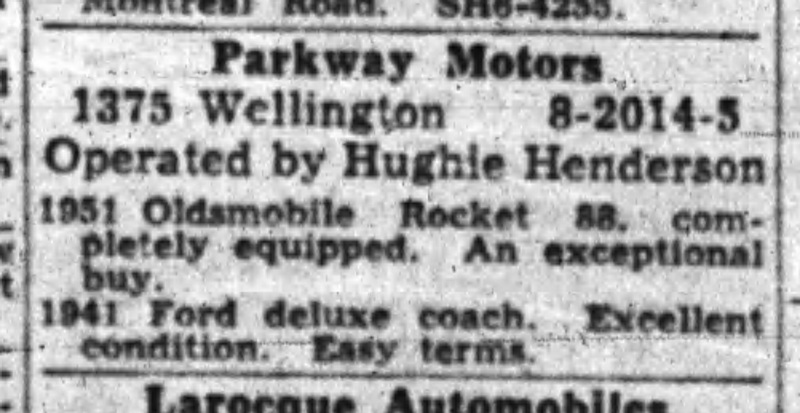 The vacant lot was immediately leased by Hughie Henderson, who opened Parkway Motors, the first car dealership in a long line of car dealerships, which technically is still the use of this lot today. 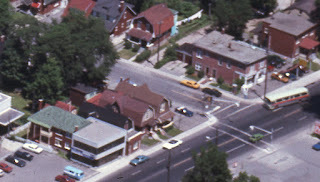 In 1952, part of the Kavanat's shop "Western Confectionery" was sectioned off (I believe even by an interior wall with a separate entrance) and the "Western Barber Shop" operated out of the east part of the building, with civic address 1377 Wellington for over 20 years, until about 1973. Moodie then rented out the corner store to tenants. But business would not go so well for Moodie. By 1963 he was out of business, and that fall he was foreclosed on by the owner of his $51,000 mortgage, an Ottawa lawyer John Barber Ebbs. Interestingly, Ebbs would maintain ownership of the property for several years. The confectionery meanwhile had different names throughout the years: Ganim's Emporium (1962), Wally's Emporium (1963-1964), Tony's Emporium (1965-1968), and finally Sam's Grocery (1969-1987). Sam was quoted in a pretty comical article in the Journal in 1977, discussing the popularity of Penthouse magazines in Ottawa, after a news distribution company was charged with distribution and possession of obscene written and pictorial matter. Sam noted that he sold "more than 90 percent of the 60 Penthouse magazines he receives each month". His trial testimony, which now is kind of funny 40 years later, noted that "all kinds of people from all walks of life buy magazines of that kind." I remember Sam and his wife, though by the time we moved onto Gilchrist in the spring of 1986, he was clearly tired of the business. I recall him sitting glumly at the cash, rarely with expression, and not really all that happy to have a 6-7 year old kid bugging him for a quarter's worth of penny candy. In October of 1987, Sam closed his store, and it became an H&R Block office. I'm not sure what happened to Sam and Ruth afterwards, I could find no real trace of them, though they did continue to own the building into the late 1990s. So there you have it, the story of 1379 Wellington Street West. A building with so much history, all the way back to when it marked the edge of the City of Ottawa, but also one that has stood the test of time over its 93 years. Just one more reason to appreciate the charm and uniqueness of the West Wellington strip! 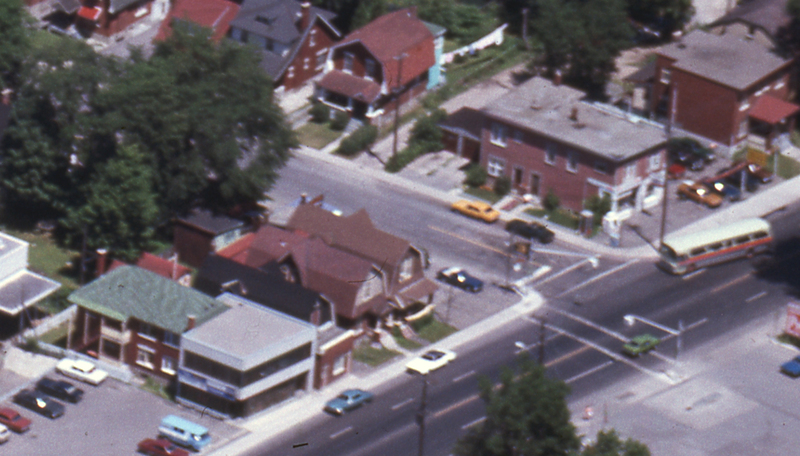 My article in this week's Kitchissippi Times is on the history of the intersection of Wellington Street West and Holland Avenue. Being arguably the busiest intersection in Kitchissippi, it has a lot of history. From streetcars to horses to gas lamps to bible agents to Laura Secords to fires and more, this corner has seen a lot of change over the 130 years of so that it has existed.